This is the hardest post I have ever written. Some of my closest quilting friends know that my beloved sister died unexpectedly in August, but I haven’t shared this sad news on my blog until now. My sister, Jacqueline, who I called Jackie, and I were very close, though not geographically as we lived almost 2000 miles apart. She was my biggest supporter in so many ways including my quilting and blogging, and she commented on many of my blog posts. During a visit to Michigan in June of 2016, Jackie pulled out a bow tie quilt top that had been completed by our mother in the 1990s. Our mother, Cleo, who died in 1997, was a gifted quilter. Unfortunately, when my mom was alive, I wanted nothing to do with quilting and literally groaned every time we went to another fabric store. Jackie asked me to finish the quilt for her but told me there was no big rush as she knew I had several other quilt projects I was working on, and she had planned to pay for the longarm quilting. I brought the quilt top back with me when I visited my sister in June 2017, so we could strategize together on how she wanted it finished. I wanted to give the finished quilt to Jackie for Christmas this year. I wrote about this quilt top as one of my 2017 3rd Quarter Finish-A-Long Goals which I rolled over to 2017 4th Quarter Finish-A-Long Goals. Jackie had planned to place the folded up quilt on the bench at the end of her bed, and I think she probably imagined pulling up the quilt on occasion to snuggle underneath when taking a nap. I decided to go ahead and finish the quilt for my brother-in-law who greatly misses my sister who was his wife of 52 years. My brother and sister-in-law generously offered to pay for the quilting of this bow tie quilt which measures 66 inches wide by 90 inches long. The original quilt top was 48” x 72” but Jackie requested that I sew on asymmetrical borders of six inches on one short and long side and twelve inches on the other long and short side using the grey grunge fabric that we both loved. My original plan was to use four extra blocks on a pieced quilt back, but I decided to make it simpler for myself and put the blocks away to use in another project down the road. I used 108” wide fabric for the quilt back and called it good. I’m pretty sure both my mom and sister are very pleased with this finished bow tie quilt. Linking up to Cooking Up Quilts: Main Crush Monday. Also linking up to 2017 Qtr 4 Finish-A-Long Finishes. 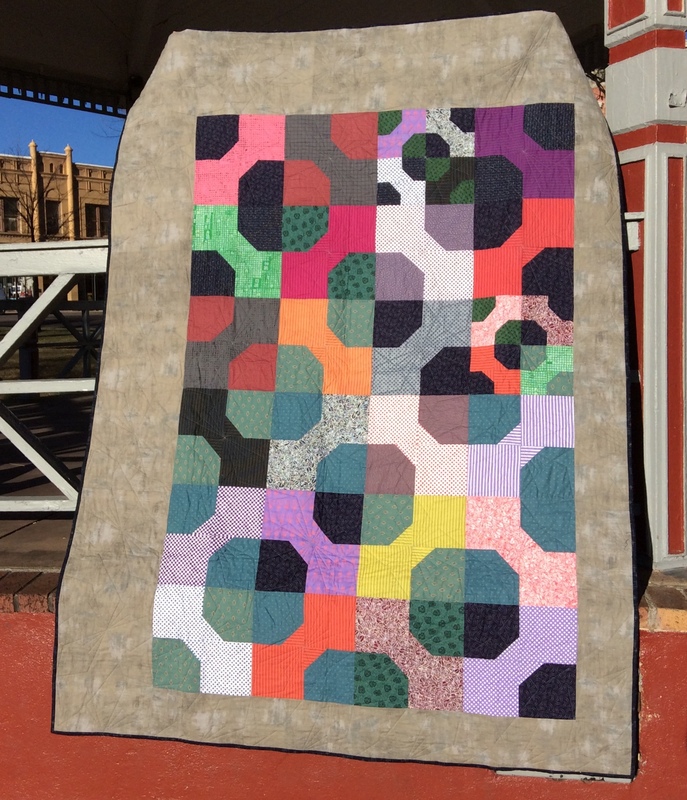 This entry was posted in Uncategorized and tagged Cleo’s Bow Tie Quilt. Bookmark the permalink. I am so sorry about your sister. It is never ever easy losing someone we love and when it’s unexpected it hurts even more I think. I recently went through the death of my brother, also unexpected. It’s very hard. I know your sister and mom would be so happy you finished the quilt. It’s a great tribute to both of them. I am so sorry, Mary. I hope that you were able to relive many happy moments and memories of your sister as you were working on the quilt, and I know your brother-in-law is going to appreciate your gift and care. Hugs and love to you. I’m so sorry for your loss. I too have a sister I’m extremely close with though we live hours apart. I can’t imagine losing her; it must be very difficult for you. Your brother-in-law will love having this finished quilt. Bless you for finishing this project for him. Sending hugs your way. So sorry. I hope you can think happy thoughts when you hold that quilt. It is beautiful. So sorry for your loss. Yes, I am sure mother and sister are pleased with the results. Those extra blocks can now be used in a special momento for you. Mary, I can’t imagine how bittersweet it might have been finishing up your mom’s lovely quilt. I think if in your shoes I would have had a difficult time sending it off and not keeping it as close as possible. I appreciate your big heart, to give this to your brother-in-law with such care and selflessness. So sorry for your loss, Mary. What mixtures of love and pain we carry in our hearts mingled with so many years of memories. That quilt reminds me of that mixture. Beautiful quilt. Such love. God bless. What an emotional finish for you. It has come together wonderfully and I am sure it will be treasured for many years by your BiL. I am so sorry for your loss. Thank you for taking part in the FAL – from the FAL hosts.